Summary: The arrival of a major new voice in contemporary fiction. As soon as I saw that Oprah picked THE TWELVE TRIBES OF HATTIE by Ayana Mathis, I knew that I wanted to read it. Then I read Entertainment Weekly's review, and that pretty much sealed it for me. For the most part, I adore family sagas (especially ones about dysfunctional families); and this story which covers five decades and tells about the ups and downs of the Shepherd family seemed perfect. For the most part, I really liked THE TWELVE TRIBES OF HATTIE. I wouldn't go so far as to say I loved it, but I did like it a lot. The book covers the life of Hattie Shepherd, her husband, her children, and even a grandchild through twelve separate narratives -- one chapter per person. In a way, each chapter is almost like a short story and stands on its own; however, they are, of course, all tied together through Hattie. 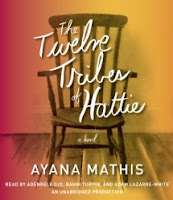 THE TWELVE TRIBES OF HATTIE begins with high hopes for Hattie who is fifteen and leaving the South for Philadelphia with her mother and sisters. However, that sense of hope soon disappears. Hattie marries young and sets herself up for a life of having babies and hard work. She loses her first-born twins to pneumonia; however, she has nine more children; and the reader quickly realizes that Hattie isn't a kind and loving mother. In fact, her kids even refer to her as the "general." The book follows each of Hattie's children, as well as her husband, through their good times and bad. Having said that, I found that the bad times seemed to take priority in this novel. Hattie and many of her children led difficult lives to say the least. One child is schizophrenic, one is suicidal, one is a closeted gay musician, and one is a slimy revival preacher. I could go on and on about her children and the pain and suffering they experienced. In fact, if I had one complaint about the story, it would be that these individuals experienced almost too much... if that makes sense. One thing that did really stand out to me, though, was the writing. I thought Ms. Mathis did an outstanding job of bringing the times and the characters to life. Her prose was beautiful and she definitely has a talent for making the reader "feel" the characters' pain. In addition, I appreciated how she took the ordinary in these people's lives and made it extraordinary. THE TWELVE TRIBES OF HATTIE would make a wonderful book club selection. Because the book covers so many years as well as many characters who experienced a variety of issues, there is naturally a great deal to discuss. In fact, there is a reader's guide with twenty questions! Some of the themes you might want to explore include parenting, death, abuse, loss, second chances, mental illness, addition, adultery, regret, forgiveness, prejudice, and redemption. Truly those themes are just the tip of the ice berg. This book could keep you thinking and talking for hours. Overall, I enjoyed THE TWELVE TRIBES OF HATTIE a great deal. Recommended for readers who appreciate family sagas. Thanks to the publisher for providing a copy of this audiobook. I've wanted to read this one every since Oprah picked it. I'm glad to see it's good. I have this on my list and am so glad you enjoyed it. I'll move it higher up! I've seen pretty much "disappointed" reviews on this, so it's good to get your perspective! That is a downfall of "family dysfunction" dramas I think...they just love to lay on the tragedy. I don't know, maybe that makes it considered a more serious literary work, but it can be too much. I've not completely decided whether I'm going to read this or not. Hummm Now I wish I had requested this one. I think I felt about this one very similarly to you ... I liked it quite a bit but didn't LOVE it as I'd expected. Definitely worth the read, in my opinion!